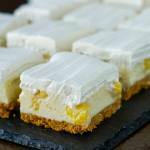 Pineapple Squares - an old no-bake Newfoundland Cookie Bar reinvented! 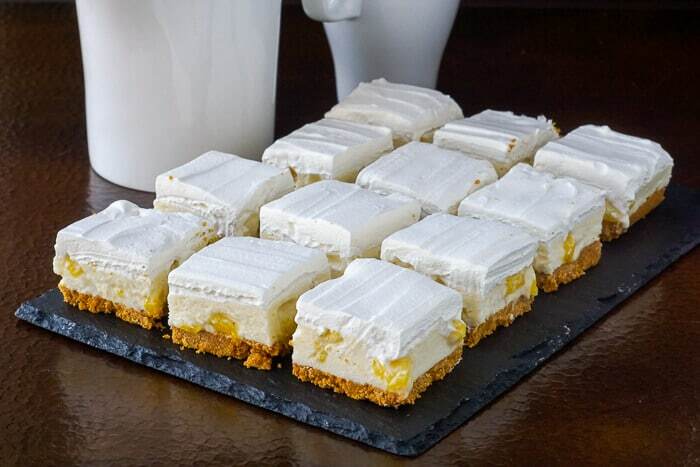 Pineapple Squares. An old time, no-bake Newfoundland Cookie Bar recipe thats been updated with a bit of a reinvention and a new flavour addition. 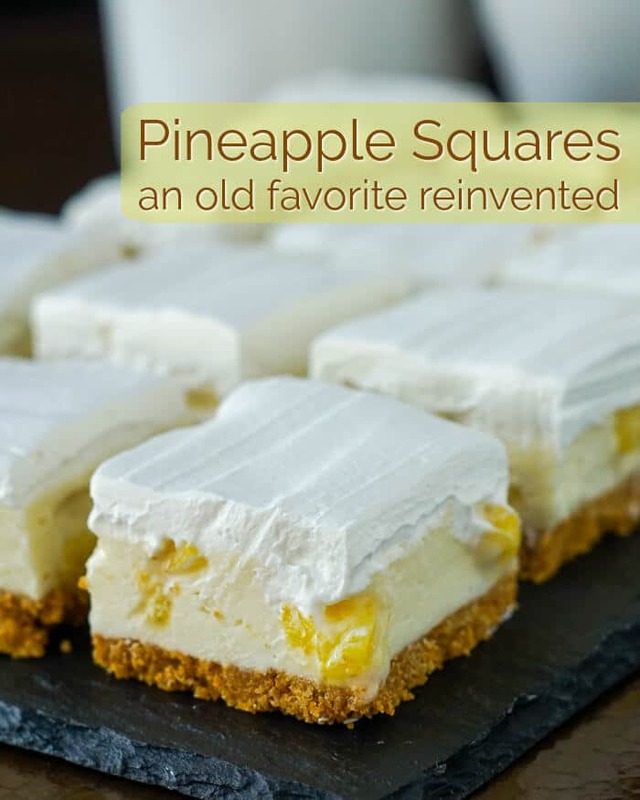 People have been asking for years for the old version of this Pineapple Squares recipe. However, I have been reluctant to post one because I just don’t make them the old way any more. This is my attempt to fix what was a pretty flawed recipe, I think. The old recipe I had seemed to be the same one that appeared in many church ladies cookbooks in the province years ago. The squares were particularly sweet with canned pineapple mixed into creamed butter frosting which contained a raw egg. Not really a recipe I’d dare to post nowadays. What was with that raw egg anyway? It often caused the frosting to split and then the juice from canned pineapple made it even worse. There had to be a better way, and that egg was the first thing that had to go. This version was inspired by a local supermarket bakery where they did a version that was icing sugar based buttercream frosting at the centre mixed again with pineapple. Again, this was quite a sweet confection but I did enjoy their version. I put the idea of reinventing the recipe on the back burner until recently when I was making a Pecan Pineapple Carrot Cake for my friend Terry’s birthday. I always use fresh pineapple in that recipe and never really buy canned pineapple at all any more. As I was frosting the cake, I thought that the combination of fresh sweet golden pineapple with cream cheese frosting was what made that version of carrot cake my favourite. That was the lightbulb moment. Make the frosting at the centre of the cookies, cream cheese icing! I quickly threw a batch together and popped them into the fridge to set firmly overnight. 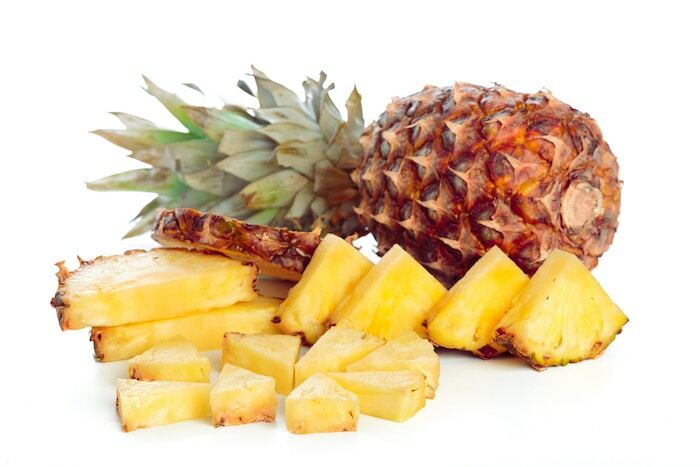 Fresh golden pineapple works very well in this Pineapple Squares recipe. The next morning I topped them with vanilla whipped cream and they cut perfectly. They are quite a rich, sweet treat; the centre reminds me of a pineapple fudge in it’s texture really. On the upside, a small portion is actually enough to satisfy any sweet tooth craving. The same recipe was also used in the past with chopped peaches and even mandarin orange pieces. I may just give the peach version a whirl with this recipe the next time around. 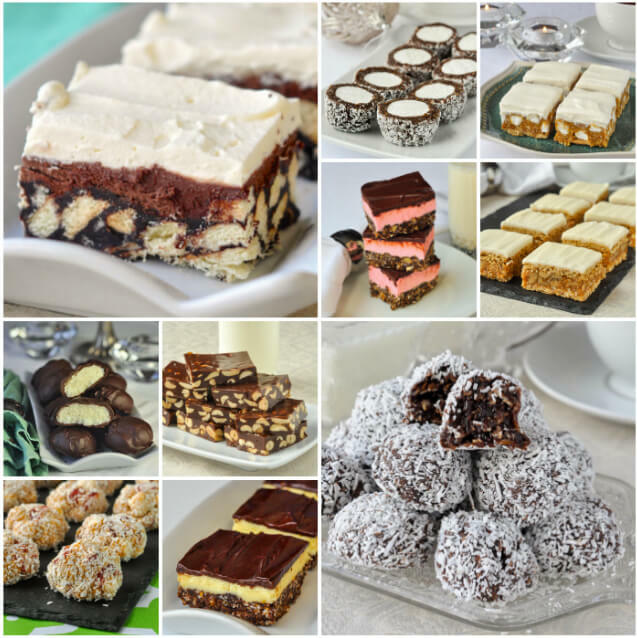 If you liked this recipe you many want to check out this great collection of other No Bake Cookies that was incredibly popular during our last Holiday season. Like this Pineapple Squares recipe? Pineapple Squares - an old time, no-bake Newfoundland Cookie Bar recipe thats been updated with a bit of a reinvention and a new flavour addition. Measure the graham crumbs into a small bowl and make a small well in the centre. Pour the sugar into the well, then pour the melted butter onto the sugar. Let this stand for a couple of minutes to let the butter seep into the sugar. Then stir well to combine all ingredients together. The purpose of this step is to get a good contact between the butter and sugar. Slowly start adding the icing sugar a little at a time. Beat until smooth and the consistency of the frosting is very stiff. Usually you would consider it too stiff to frost a cake at this stage. Fold in the finely diced pineapple. The pineapple should be drained of all juice. I actually let mine sit in a colander lined with paper towels. Spread evenly over the prepared base and chill for several hours or overnight. Beat together the 3 ingredients until stiff peaks form. 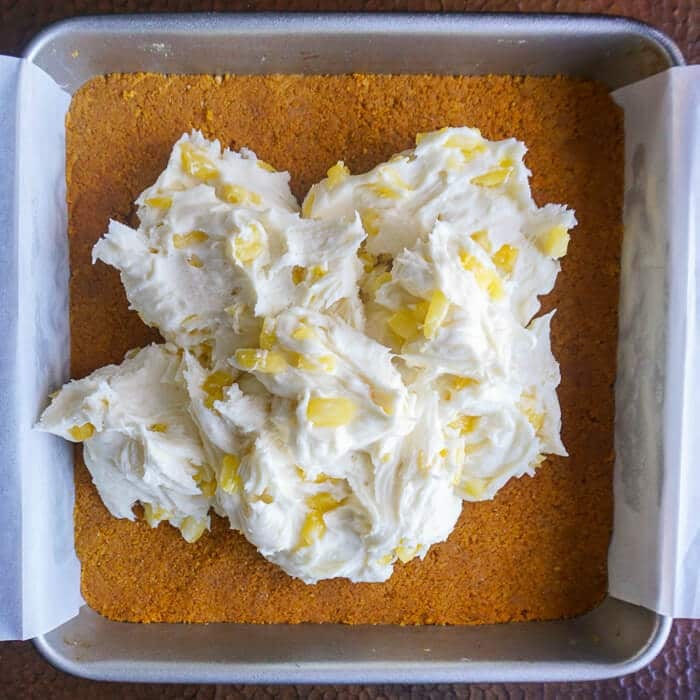 Spread evenly over the chilled pineapple frosting layer. Store in the fridge until ready to cut and serve. As several people have noted, these are quite sweet and rich, so if that's not your thing, probably pass on this recipe. Treat them like Nanaimo bars or fudge. A small serving is enough. Since these are very rich cookie squares, You can use the same amount of filling in a 9x13 inch pan if you like. This will make the squares about 1/3 thinner, plus you will get about 1 1/2 times more servings. Simply increase the bottom and top layers by 1 1/2 times the recipe and leave the filing as it is. If you are freezing these cookie squares, I would suggest freezing them without the whipped cream topping and then adding the topping when thawed and ready to serve. Although it is not my preference, many non-dairy whipped toppings will freeze pretty well if used as the top layer. Previous Post: « Blueberry Sour Cream Flan – or use any fruit topping! Six cups of icing sugar!!! Is this correct? This recipe is in the same category as a Nanaimo Bar or fudge. Quite rich, so I normally cut them smaller than normal. Found another recipe w 1.5 cups icing sugar which I will use . Thanks for responding in any event! We must remember this is a receipe from the 70’s when baked goods were very sweet. The amount of sugar can likely be reined back to suit modern tastes. I remember loving these when my mother-in-law made them so I will give them a try with one alteration. Will be swapping the graham wafer crust for a Nilla wafer or coconut cookie crust. Thanks for reminding me of these yummy squares that were produced for many a wedding or baby shower in the 70’s. Can you freeze these? Thank you. Sorry didn’t read the notes. I have gotten more health conscious over the years and I no longer make the traditional graham cracker crust, (not that it makes a lot of difference with a rich dessert, but every little bit helps, right?) I just lay flat graham crackers down in a single layer and put the filling over the top. After a few hours in the fridge the crackers soften and are a great base. I’ve also used coconut cookies as a base…just a flat single layer…not healthier, but it’s easier. No extra sugar or butter with the crust.